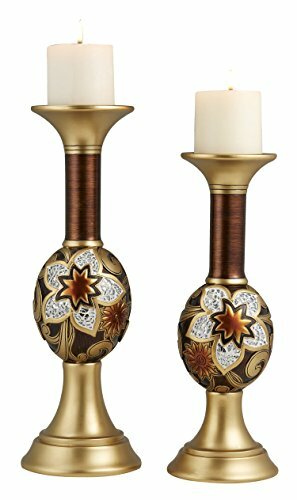 The candleholder set makes an elegant accent in your dinning room or living space. It features a wood finish with Golden and orange floral designs with mosaic glass tiles. Display on a mantel or table to cast a warm glow in your home. If you have any questions about this product by OK Lighting, contact us by completing and submitting the form below. If you are looking for a specif part number, please include it with your message.